Iowa’s University Center for Excellence on Disabilities (UCED) and the Center for Disabilities and Development (CDD) are seeking input from individuals with disabilities across the lifespan , as well as family members and caregivers, on areas of need that might be a focus of their future work. During the month of October, they will host a series of community conversations across the state and have identified five topics they are looking for input on, including employment, housing, education and lifelong learning, health and wellness, and transportation. 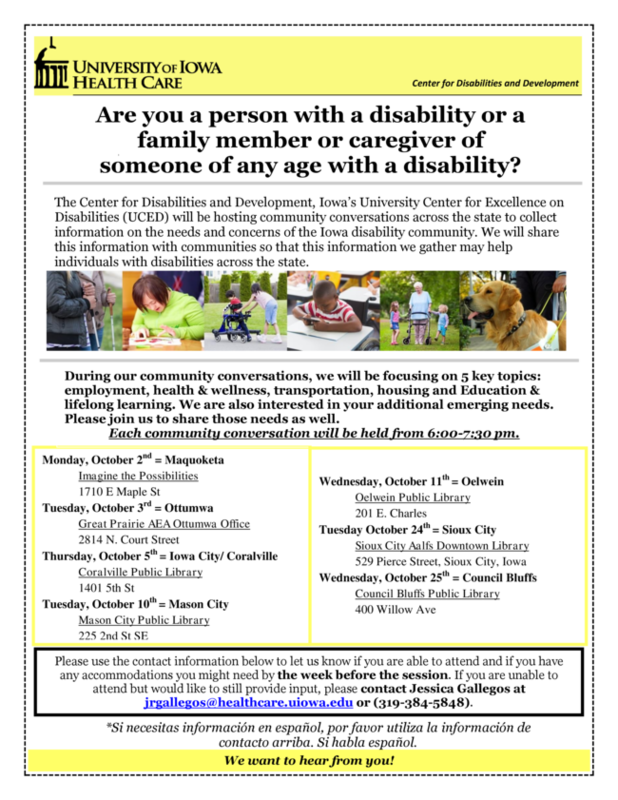 The goal is to collect input on the needs and concerns of the Iowa disability community. They will use this input to form their 5-year plan and will also report key findings to the public. Please Pass the Love is offering three new eight-week youth programs to help build self-worth through building friendships, social skills and communication skills! This opportunity will be filled with games, activities, and the chance for students to feel safe and empowered. The programs are free and will be held at Meredith Middle School in Des Moines, on Monday evenings 5:30-6:45 pm beginning October 2. Space is limited, so sign up today! The 46th annual Learning Disabilities Association of Iowa Conference offers 15 breakout sessions, silent auction, book sale, and three national keynote presentations! "Self Esteem for Kids With Learning and Attention Issues"
"Mental Health in the Classroom: What To Know, What To Do & What Not To Do"
Early bird registration ends October 16! Details and registration available at http://iowa.ldaamerica.net/conference/17conferencehome. Each module will be a 2-hour interactive session that will encourage participants to address specific areas of interest. There is a $25 fee per session. Click here for learning objectives and to register! Hello, It's Us! Perspectives on Inclusion is a weekly show produced in Iowa City by the Center for Disabilities and Development (CDD) at University of Iowa, and is co-hosted by CDD staff member Mike Hoenig and long-time disability advocate Keith Ruff. Both hosts have significant disabilities and use public access television to highlight a variety of disability issues, including legislation and policy. Hello, It's Us! examines the advantages of inclusion from many different perspectives. The program airs every Monday evening from 8:30-9:00 pm on Public Access Television (PATV) Channel 18 in Iowa City. Current and archived episodes are also available on the "Hello It's Us" YouTube channel. Creative Spirit, an emerging nonprofit, is looking to make a dent in what they say is an estimated 8 million Americans with intellectual and developmental disabilities who lack integrated employment.